Heroes Review: It's Finally Over! For months on end, season four of Heroes has caused us nothing but anger and anguish. It's been an abysmal, illogical, slow-developing series of episodes. But we were finally able to laugh out loud at the conclusion of this week's episode, which revolved around Claire and HRG fighting. Yes, again. If that doesn't get your heart-racing for another season of this show, nothing will! Before I get to my review, allow me to ask, in all caps no less: WHY WAS THIS VOLUME TITLED "REDEMPTION?!?" WHO WAS REDEEMED? Or, as is most likely the case, did the writers simply forget this was the title as early as the second half hour of the season? Overall, "Brave New World" was simply weak and uneventful. As always, it was filled with utterly random actions - hi, Tracy, thanks for stopping by out of nowhere, slithering through mud and disappearing again! - and storylines with no exciting pay-off. But more than anything, it was simply... there. There was no suspense and no emotional attachment to anything going on. There was nothing especially awful about the hour, but nothing remotely season finale worthy, either. Seriously, did anyone think HRG was gonna die? 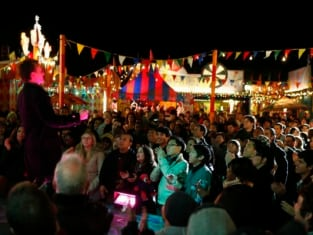 Did anyone feel as though the carnival storyline had a worthy conclusion, when Samuel's people simply walked away because a of couple people said so... and then Samuel squared off with Peter for six seconds, a character that was involved in an entirely separate storyline for the duration of the season? He came down with a brain tumor as a result of time traveling. It was magically cured because he had a dream. His true love was sent away by Samuel, ignored for numerous weeks, and then showed up again on the same hospital floor as Hiro, following his nonsensical cure. She's now an old woman with a family because Samuel sent her back to the 1940s, so Hiro said goodbye and... that was it. We know the economy is poor and we don't wish harm on anyone - but every person associated with Hiro's storyline should be fired immediately. The show created two supposedly pressing issues for the character (a brain tumor and an abducted girlfriend) and solved each by simply, literally making crap up. We'll have his dead mother kiss him in a fantasy! We'll have Charlie appear in the same hospital as an older woman! It's legitimately incomprehensible that the show's producers have jobs. If anyone was inspired by this episode to be psyched for a fifth season, we'd love to hear from you. Was it Hayden Panettiere's terrible acting that roped you in? Ando's ability, which can seemingly be used for whatever is most convenient at the time? The mystery of Sylar, who was bad, then suddenly wanted to be good, especially after he was stuck in a dream for what felt like five years and is now - as that profound, dynamite quote of his revealed - a hero? Why did he ever give Claire a compass to begin with? Or play games with her and HRG's past? If the guy was such a monster, why not just kill HRG? If his ex-girlfriend hadn't rejected him... would the show have simply canceled the final few episodes? As noted previously, he never had any actual plan until he got dumped. 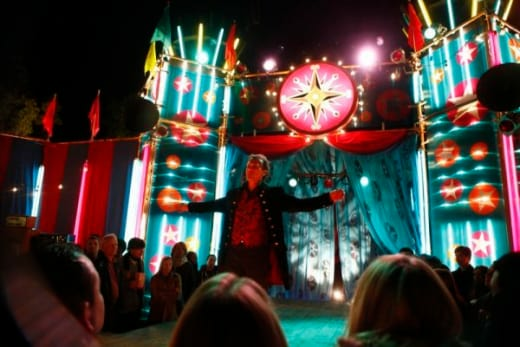 Think about how the carnival storyline played out: Samuel told everyone they had to show the world what they could do, and everyone agreed. Edgar and Eli then showed up and told everyone else something different... and they agreed. And that was it. That was actually the way this season's major plot wrapped up. These carnival folk are more gullible than Sarah Palin supporters. We scarcely have the energy at this point to go on about all the negative aspects of this show, so let's leave it at this: it's boring. It's painfully, painfully boring. Please, NBC, you've caused Conan O'Brien and his followers enough pain. We beseech you: don't torture the rest of us by keeping this show on the air.